Exterior looks great, albeit a bit derivate in parts. Interior material quality looks good and in line for the segment. But interior design is a huge letdown. It looks more like a posh Mazda 6 inside than a competitor to the Germans and Infiniti Q50. Man the comparison test with the 3-Series, IS, C-Class, A4, XE, Q50, ATS, and Giulia should be fun! Not sure why you even mention the GS other than to get a rile. It's 192.1" in length vs the G70's 184.4". This is an IS competitor which is 183". Genesis G70 is a 2019 model. 5th Gen GS will be a 2019 model, nbd. I couldn't agree more. I have toyed for nearly two years with buying a Genesis 5.0 and G80 5.0, but I can't get past the Hyundai service. I've contacted a few dealers here in Southern California and have not been impressed with service. They really need to open standalone dealers if they want to be competitive. If they're not planning on doing so, at least train the sales agents that someone buying a $20k car is looking for a different experience than someone buying a $60k+ car. On a different note, I have yet to see a G90 here on the road in Los Angeles, one of the most premium heavy markets in the US. I'm on the road all over Southern California and have seen one in San Diego. Looks like this will be another Equus in terms of volume. Blah. The front is way to busy and confused below the headlights. There are gashes and fillers in all directions, choking off areas that would look better if left open. The rear is very Infiniti and Mercedes C class. The taillights would have looked better stretched out instead of being vertical. Interior is fair at best. Really tired of the retro quilted seats and hooded gauges. Wish designers would move into the next stage of the future instead of rehashing the 70's. Other than the power output, I see little keeping this car fresh and moving out of dealers. It isn't just the Genesis models. Few other large-sized (by today's standards) or luxury sedans are selling well....in the U.S., right now, it is simply not a sedan market, thanks mostly to SUVs. That applies to almost all of them.....Lacrosse, Impala, Continental, MKZ, CT6, CTS, XTS, Impala, Cadenza, Avalon, etc..... The Hyundai Azera has already been dropped in the American market, and GM is considering doing the same to all of its large sedans. Buick even dropped the mod-size Regal sedan, and will be carrying on with a Regal hatchback and wagon. The Lexus ES350 is one of the few exceptions that is still selling well enough keep its head above water. haven't seen a G90 and hardly see any G80s, older "Genesis" models yes, but not the new premium brand G80. additionally the local dealers aren't carrying any inventory of the G90s, special order only apparently. and no G80 Sports within 50 miles of me. The "Genesis" dealer by my office had 3 G80s, and they have been sitting there for 2 months at least. front is cheap and ugly looking. Looks like a rodent. The headlights look too similar to hyundai's, and the angle of the headlights doesn't flow with the grille. A lot of these cars suffer from weak chin. overall looks competent, but gets a meh from me. Last edited by pman6; 09-15-17 at 06:22 PM. Even on its debut it never sold anything close to 30k per month. That's Camry territory. 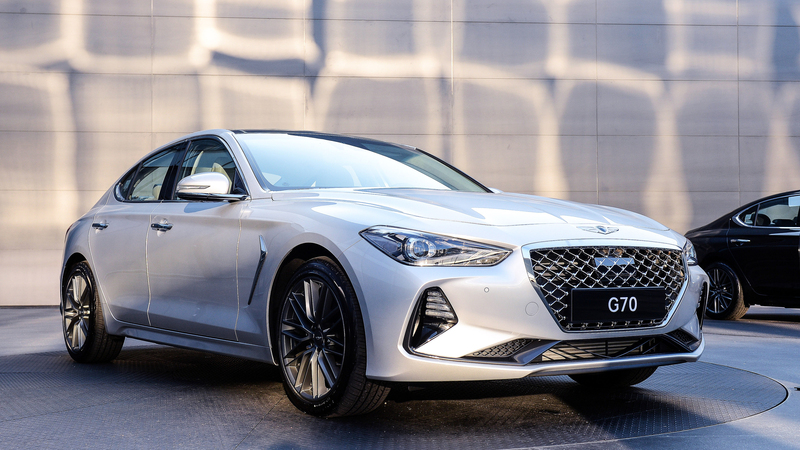 The G70 looks decent enough and rounds out the Genesis sedan lineup. Still, they can't get their CUV and SUV to market soon enough. That's where the consumer interest and volume is right now. Not bad, I kinda like it. I like it alot. Has a very European feel to it. Not too crazy about the complex/overly aggressive front end but most automakers are making them these days.... guess that's how it it now. Meant to be 30k+/yr on debut; rather than 30k+/mth. no 'rile' intended i really thought this g70 was bigger. as for the is, i do think this g70 is way better looking. Last edited by bitkahuna; 09-15-17 at 11:23 PM. At first i thought the high trunk lid was awkward but now i think they're going more toward bmw's gran coupe look and maybe it has more trunk space than a typical competitor.